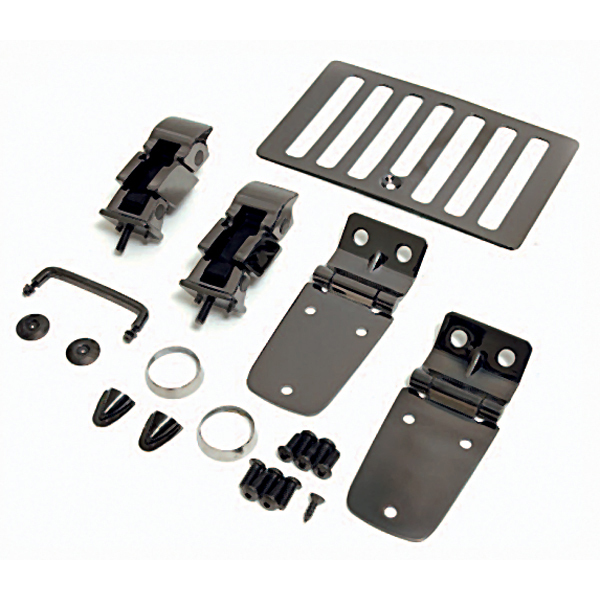 HOOD KIT, BLACK CHROME, 98-06 WRANGLER - Jeep Parts Guy - All the Jeep Parts You Need! This beautiful multistage Black Chromed finish over rust proof prime 304 stainless gives your Jeep a rich and distinctive look. Each accessory is polished to a mirror finish and then individually dipped to ensure the Black Chrome is polished to a mirror finish and then individually dipped to ensure the Black Chrome finish jumps out. The three dimensional look you get from Black Chrome complements today’s deep colored vehicles. Because our Black Chrome accessories are constructed from prime 304 stainless steel (including all mounting hardware), you will never have to worry about rust or corrosion. Kit includes set of Hood Hinges, Windshield Tie Down Kit, Hood Vent, and Footman Loop.